"I.V. Triste Fin a Una Licencia, La Profilaxis Impide la Infeccion Venerea!" The caption in this poster is in Italian. 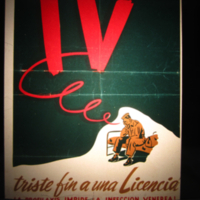 Lamenting that contracting VD is a sad end to a furlough, it also warns viewers to use prophylaxis. "Most Promiscuous women have VENEREAL DISEASE!" This poster warns men to avoid promiscuous women. It also includes a map of prophylaxis station locations. 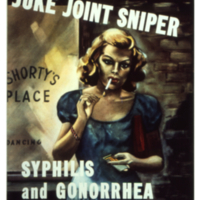 "Don't take a chance, Take a Pro"
"Juke Joint Sniper, Syphilis and Gonorrhea"
This poster features an image of a woman smoking outside of a "juke joint" and warns audiences that she is a source of VD. 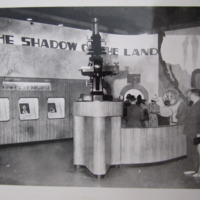 This is a planning sketch for an exhibit at the 1939 World's Fair. 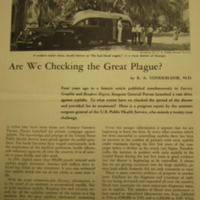 "Are We Checking the Great Plague"
This is an article by R.A. Vonderlehr in Survey Graphic giving an update on the state of syphilis control in the US. 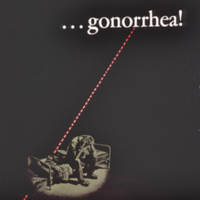 "...Gonorrhea! 'No,' Is the Best Tactic; the Next, Prophylactic!" 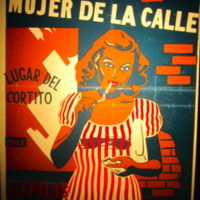 The poster shows a woman outside a dance hall smoking and associates her with venereal disease. "Ja! Ve Should Giff Medals to Der Pickups. 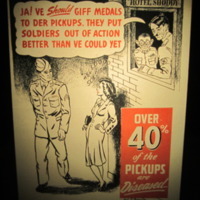 They Put Soldiers Out of Action Better than Ve Could Yet"
"Over 40% of the Pickups are Diseased"
This poster features a woman soliciting a soldier on the street. Hitler and Tojo look on, commenting that diseased pick-ups help the Axis. 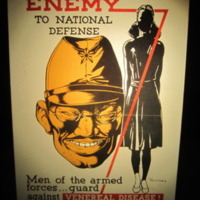 "Another Enemy to National Defense"
This poster juxtaposes an image of Hirohito and an silhouette of a young woman, warning that they are both threats to the war effort. It also uses statistics to convey the significant cost of venereal disease. 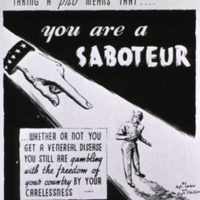 "Exposing Yourself to a 'VD' Without Taking a Pro Means That...You Are a Saboteur"
"...Whether or Not You Get a Venereal Disease You Still Are Gambling With the Freedom of Your Country by Your Carelessness"This poster warns soldiers that failing to use prophylaxis threatens the nation. 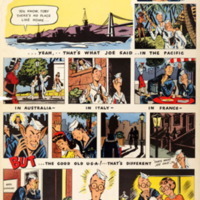 This comic features two sailors. One picks up women all around the world and ends up sick. The other ignores other women and returns home to his sweetheart. 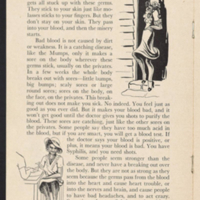 "Warning: These Enemies Are Still Lurking Around"
This cartoon warns that women with venereal disease are threats to military men. 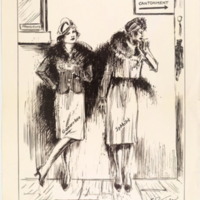 Two women are shown waiting on a corner, smoking. They are labeled "gonorrhea" and "syphilis." A sign shows that military bases are nearby. 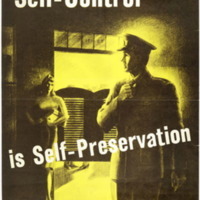 "pick-ups spread Syphilis and Gonorrhea"
This poster warns servicemen to avoid pick-ups, sources of VD. 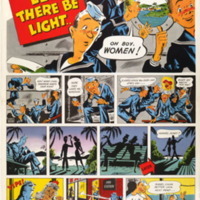 This cartoon presents prostitutes as a threat to the health of servicemen and the war effort. The female figure is labeled "venereal carrier." 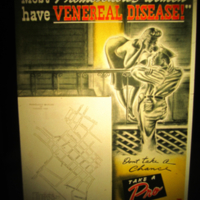 "Easy to Get...Syphilis and Gonorrhea"
This poster features an image of a woman and warns that VD is easy to catch. 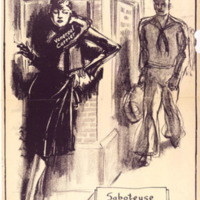 "Prostitution Spreads Syphilis and Gonorrhea"
This poster warns that prostitution spreads venereal disease. 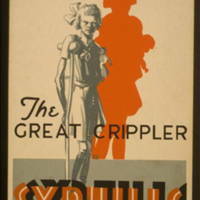 An image of a young girl with a crutch along with the caption warns viewers of the effects of syphilis. 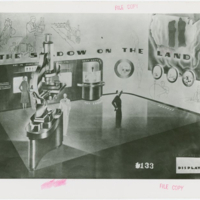 LOC Notes: Produced for the town of Hempstead Health Dept.